Necklace in 18k yellow gold and diamonds, exclusive design Carrera & Carrera. 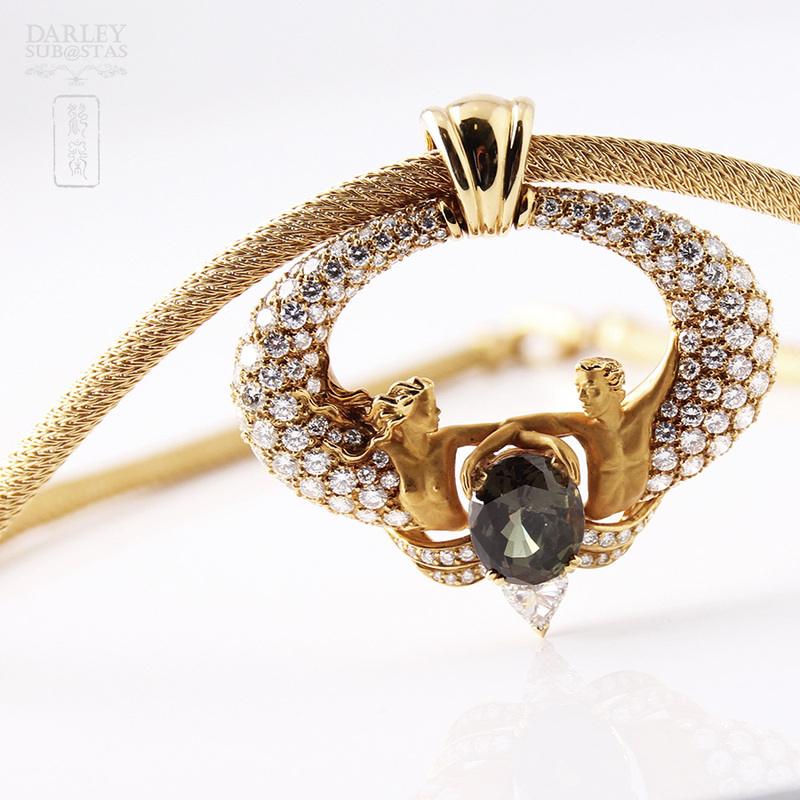 ART GALLERY > Necklace in 18k yellow gold and diamonds, exclusive design Carrera & Carrera. "Necklace in 18k yellow gold and diamonds, exclusive design Carrera & Carrera." Necklace in 18k yellow gold and diamonds, exclusive design Carrera & Carrera. Fantastic shape model that two independent parts. On the one hand we have the necklace, lace solid model with classic drawing pin and clasp with a length of 40 cm. For he spends a precious pendant unique design, which is held by a handle double wedge profile. Traces its facade from a ring-shaped oval and slightly curved which is opening its lines, definition, to the central motif, and placed on its surface a succession of diamonds, brilliant cut, crimped in Grane. That plea is the main drawing room and two fabulous design facing busts, male and female, with shapes inspired by ancient Greece, which emerge two undulating lanes lined by a total of 18 diamonds, brilliant cut, pushing their bodies to Inside the front and showing a contrast between their bodies matte and shine of her hair. They open their arms to steady, with one of them, to the ring, while the other intertwine to embrace a natural gem ALEJANDRITA in bright green (in daylight) brownish-green (in incandescent) purple - Brown, faceted oval cut, 7.48cts weight, measure Alexandrite: 12.22 x 10.24 x 7.84 mm, which is enshrined by four points with double claws. A diamond piece tops, heart size, which is below gem, between the rails, and engages with claws. The extent of the pendant is 5x5 cm. A next international certificate Laboratoy "Gübelin"